I bought this helmet in 2008 from the owner in the town of Dordrecht, but unfortunately he did not know any of its previous history. The helmet is a German Draeger helmet of the ‘Einfacher’ design which was introduced during WW2 (see chapter: ‘1899 Draegerwerk’). The serial number dates it to about 1943 and the helmet probably ended up in Holland during the German occupation of the Netherlands. 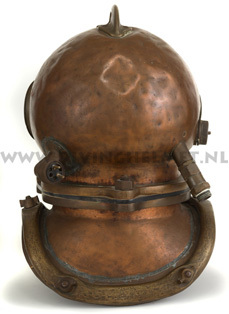 The breastplate of the helmet has been modified to be used with suits of the Siebe Gorman 6-bolt ‘Admiralty Pattern’ diving dress. 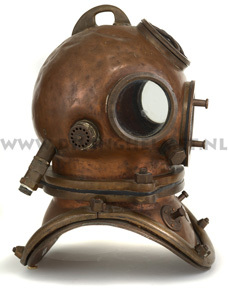 This type of apparatus was adopted by the Dutch military after the war and by several civil diving companies (see chapter: ‘1904 Siebe Gorman & Co. Ltd.’). 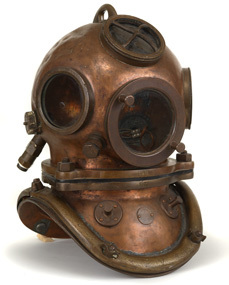 The helmet shown here has also been modified to be used with other Siebe Gorman diving apparatus: the telephone connector is of Siebe, Gorman type and not the usual Draeger one. I have not been able to find out what ‘ZOCK’ stands for but it was probably a local machine shop.